Analysis: Democrats are divided over whether — and how fast — to impeach the president. That hasn't stopped them from launching down that path. WASHINGTON — This city is waiting with bated breath for special counsel Robert Mueller's report on his investigation into the Trump operation's ties to Russia and possible obstruction of justice by the president and his allies, which is widely expected to land soon. But even without those findings in hand, House Democrats effectively launched the impeachment process this week. 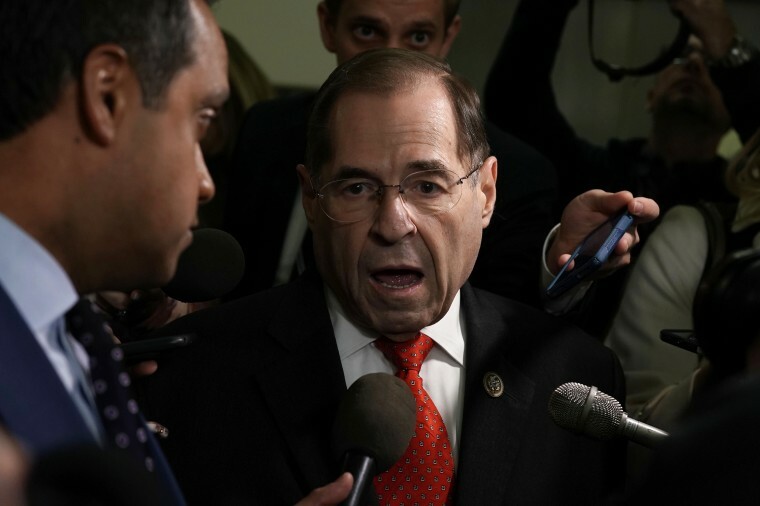 Rep. Jerrold Nadler, D-N.Y., the chairman of the Judiciary Committee, demanded a ream of documents from Trumpworld; Rep. Adam Schiff, D-Calif., the chairman of the House Intelligence Committee, beefed up his staff; and Rep. Bill Pascrell, D-N.J., a member of the Ways and Means Committee, told NBC his panel would likely ask for Trump's tax records in the next "two, three weeks." The Mueller report won't be the beginning of the end of the investigation into Trump. Instead, it will be the end of the beginning of a political and legal nightmare that promises to subsume an ever greater portion of his presidency and could, conceivably, lead to his impeachment. For Trump and his Republican supporters in Congress, the latest moves by Democrats in Congress — which come alongside a New York state investigation into his company's insurance records, the latest in a long list of state probes of his finances — amount to a partisan push to overturn the results of the 2016 election that could backfire on his adversaries. Democratic leaders are trying to carefully shepherd a two-step process that begins with investigations which might or might not lead to impeachment. Earlier this week, Nadler, Schiff and House Oversight and Reform Committee Chairman Elijah Cummings, D-Md., wrote letters to White House officials explaining that they were expanding their inquiry into the possible destruction of documents relating to Trump's private meetings with Russian President Vladimir Putin because the administration had not responded to a request to turn over relevant records. The lines of investigation run from Trump's campaign and White House operations all the way to his tax records and business dealings, and some Democrats are convinced they will ultimately be able to use their findings to tell the story of a president who has committed offenses for which he should be removed from office. But there's tremendous friction within their own party over this methodical approach. Some lawmakers, like freshman Rep. Rashida Tlaib, D-Mich., have already grown impatient with the pace of the process. Tlaib said Wednesday that she would introduce a resolution this month calling on the Judiciary Committee to formally begin impeachment proceedings. Earlier this year, she grabbed headlines when she was caught on camera telling supporters Democrats would "impeach the motherf---er." But many House Democrats aren't ready to vote to impeach the president. Some don't believe they've seen enough evidence of "high crimes and misdemeanors" — the Constitution's standard for impeachable offenses — while others say it's a fool's errand for the House to pass articles if there aren't 20 Republican senators ready to help create the two-thirds majority needed to remove Trump from office. The tension within the caucus is palpable, especially as a crop of newcomers who won in heavily Democratic seats push to take action, while those who helped create the new Democratic majority by winning Republican-held territory are generally more circumspect. Rep. Anthony Brindisi, a Blue Dog Democrat from upstate New York who is representative of the latter group, said there's been a noticeable ramping up of impeachment talk on Capitol Hill in recent days. "It sure feels like it," he said in an interview Wednesday morning. That concerns him because "it could sidetrack us" from demonstrating to voters that Democrats can move forward with a policy agenda. "I'm not for impeachment," he said. "It's going to be a high bar." The investigation piece must be a predicate for impeachment, said Sen. Ed Markey, D-Mass., who attributed the seemingly sudden shift in urgency to the power Democrats now have in the House. Earlier in the year, they were focused mostly on a fight with Trump over a partial government shutdown and the question of whether Congress would fund his border wall. Now, though, with the government re-opened and the wall brawl in the hands of federal courts, committee chairmen are starting to get down to investigative business. What is the Democratic threshold for impeachment? "All questions about the Trump White House have been bottled up for two years," he said. "This is an accumulation." Trump sees a sprawling "witch hunt" designed to bring him down at any cost. "Now that they realize the only Collusion with Russia was done by Crooked Hillary Clinton & the Democrats, Nadler, Schiff and the Dem heads of the Committees have gone stone cold CRAZY," he wrote on Twitter Tuesday. "81 letter[s] sent to innocent people to harass them. They won’t get ANYTHING done for our Country!" While it's clear the House has now jumped headlong into what could be a lengthy process for investigating and possibly impeaching the president, senior Democratic lawmakers are still trying to play down the extent to which they are turning up the heat. "We're just doing our regular oversight," said Rep. Zoe Lofgren, D-Calif. But with Mueller's report widely expected to drop shortly, they are also preparing to take up the investigative baton.